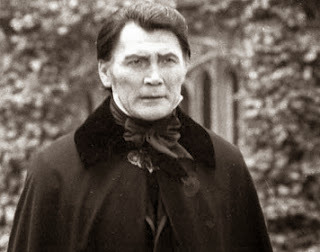 In 1973, director Dan Curtis teamed up with writer Richard Matheson to produce a Dracula adaptation starring Jack Palance. This TV movie was supposed to air on October 12, 1973, however if was pre-empted by a live television address by U.S. President Richard Nixon. Instead, the production aired the following February--perhaps not the most suitable time to run a vampire story (although its lost love aspect does make for suitable viewing around Valentine's Day). Dracula will finally be released on Blu-ray this May, and is worth picking up, considering some of the more unique elements of this adaptation. 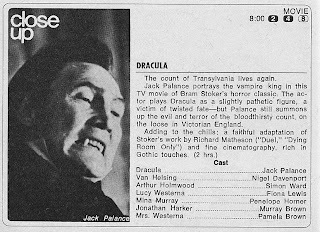 In this version, Jonathan Harker travels to Transylvania at the behest of Count Dracula, who wishes to relocate to England and purchase some property there. Yet Harker soon discovers that Dracula isn't quite human, and when the vampire leaves for his new home, Harker ends up imprisoned within his castle. In England, Dracula sets his sights on Lucy Westenra, whom he believes is the reincarnation of his long-dead wife. 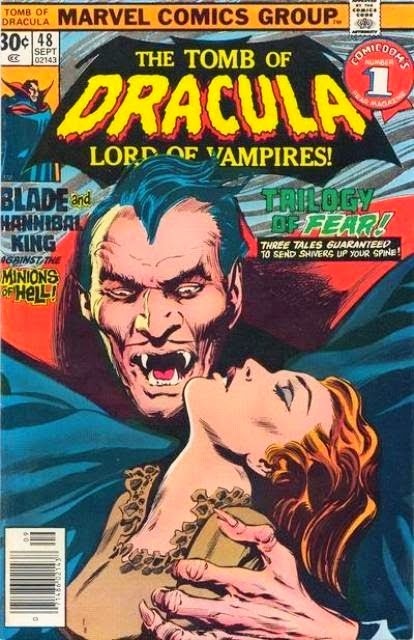 This story diverges from the novel quite a bit, especially with the characters Jonathan Harker and Lucy Westenra (she's now the main reason why Dracula relocates to England). 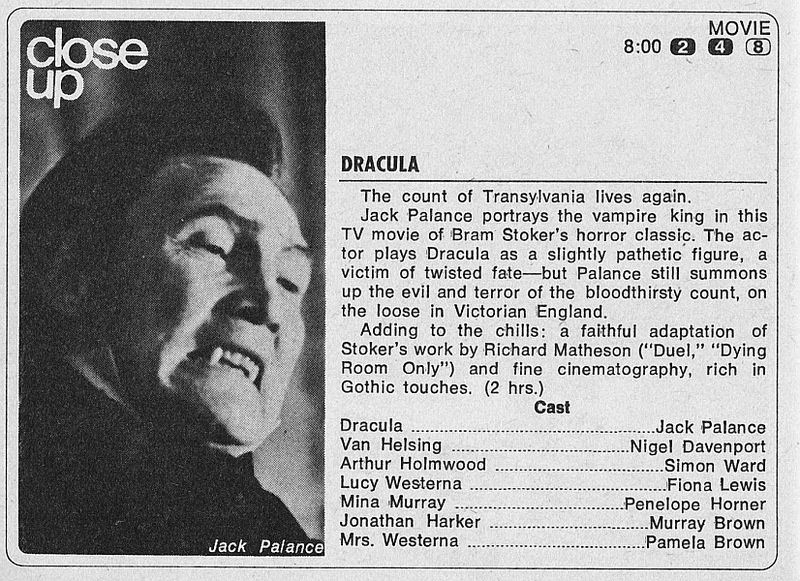 Borrowing elements from Dark Shadows, the story also introduces themes that are now commonplace in many Dracula adaptations. These include the reincarnation of a lost love one, and re-imagining the historical figure Vlad Tepes as the fictional character Count Dracula (and is likely the first film to do this). Palance plays the Count as more animal than human, and I found the story suffered at times from his performance; overall, I expected better things from the horror dream-team of Curtis and Matheson. Still, the film is a worthwhile addition to your DVD collection due to the new elements that it adds to the Dracula lore--and will be available for the first time on Blu-ray in May, 2014. According to the releasing company, the film has been transferred and restored in 2K High Definition from the original 35mm camera negative, and the special features will include interviews, a trailer, and an alternate ending. An interesting side note: artist Gene Colon used Jack Palance as the model for his Count in the comic book series Tomb of Dracula (1972). After seeing his performance in the 1968 TV movie The Strange Case of Dr. Jekyll and Mr. Hyde, Colon thought Palance would make a great Dracula!